Dilshan Boange’s Textual Tapestry is an intriguing collection of poems and short stories. Some of the short stories are written within a Sri Lankan context, others transcend countries and cultures. The poems in the collection have a universal appeal and draw in readers from every culture. Some of the stories bring into sharper focus the sights and atmosphere, culture and characteristics of Sri Lanka. My personal favourite short story in the collection was “Dinner with the Devil”. The entire story is no more than around 1,500 words, yet is powerfully thought-provoking. It is written in the first person and comprises only two characters. Yet it is a warning about the deceptive and seductive nature of darkness and evil, as well as being an entertaining short story. It reminded me of C.S Lewis diabolical “Screwtape Letters” which are still popular to this day. The popularity of this book lies behind Lewis’ ability to make the reader understand the tactics of the devil. This short story does a similar thing in that the reader feels that the author/narrator is getting lured in. The reaction of the reader is to warn the narrator that he is being seduced. People have been telling short stories for since the beginning of human civilisation. Cavemen painted the stories of successful or memorable hunting trips on cave walls. Ancient Greeks and Romans compiled hundreds of stories about the gods and goddesses they worshipped, and their mythology is still widely read today. In Native American cultures it was common for people to gather around a wise storyteller, who would pull an article, such as a feather or a claw, out of a bag, and tell a story about the animal it came from. Even today we gather around campfires and listen as our friends tell us ghost stories. None of these stories are ever extremely long and complicated, otherwise the listener might become confused or lose interest. Yet the form has always been something that most people enjoy. Therein lies the power of a short story. It is a piece that that can be read in one sitting. The writer doesn't spend a lot of time developing a complicated plot and many characters; instead he or she focuses on one main concept and finds a way to effectively tell it. The written short story as we know it today is relatively new. Writers like Poe and Edith Wharton in the mid 1800s strove to make it popular by writing short stories themselves. Poe edited several magazines of short works, and many nonfiction books follow the rules for short stories that he laid out. Artistically, short stories are a challenge to the writer. They have a strict form, which is often best limited to a few scenes and often few characters besides the main character and an antagonist. Yet at the same time they open many possibilities to singularly explore a plot, character, or concept. 1. The Plot which is the arrangement of incidents or events in the short story. * Flat Character - a character who doesn't go through a change. These characters are usually one-dimensional. * Round (Dynamic) Characters - a character affected by the events of the story. These characters are usually fully developed in terms of personality. They are described in more detail and their personalities emerge more fully. Round characters usually become enlightened, learn, grow, or deteriorate by the end of the story. * Protagonist - The main character of the story (and sometimes the narrator. This is the case when the author uses first person narration. * Stereotyped Characters - a character who is so well known that little has to be said about him/her. These characters are immediately recognizable because of the role he/she plays. Examples - the strong silent gunfighter, the nerd, the beautiful international spy, the mad scientist, etc. * Antagonist - This character opposes the protagonist. Often, he/she is an opponent to the main character and is sometimes right and justified in his/her actions. Of course it goes without saying that not every short story contains all of these character types. 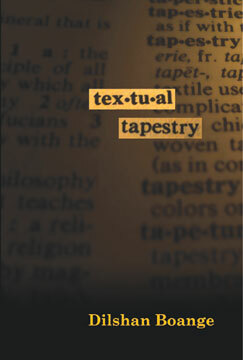 In fact many of the stories included in Textual Tapestry have only one, two or three types of character. That is often the key to the fact that the stories are so intriguing. Whilst other characters may be alluded to, we don’t meet them and are left to draw our own conclusions about them. Less is sometimes more when it comes to engaging the reader, since the writer not only allows, but encourages us to use our own imagination. 1. The Setting. The physical background of the story - where and when the story takes place. 1. Atmosphere. This element has a closer connection to the setting because the setting often determines the atmosphere. This is created by the mood or tone of the story. Physical surroundings affect a character and determine his mood. Atmosphere is usually established at the beginning of the story. It takes in characters, clothing, furniture, natural surroundings, light, darkness, shadows, weather. * Diction - word choice. Word choice can be formal, informal, colloquial or slang. * Formal diction is usually found in academic texts, academic papers and formal discourse. * Informal diction is relaxed conversation and is found in writing that has a lighter tone and is sometimes humorous. * Colloquial diction is the everyday usage of a particular group. 2. Slang is defined as a newly coined word not accepted for formal usage yet, and is usually not found in the dictionary. * Point of View - The vantage point from which the author presents the action of the story. It is the person telling the story: the narrator. b. - when the person telling the story is not part of the action.first person narration - This is a major, minor, or a silent character who tells the story. * Irony refers to some sort of discrepancy between what is expected and what actually happens.
. Verbal irony - the opposite is said from what is really intended (sarcasm) Example - "Wasn't that a smart move!!" a. Dramatic irony - a contrast between what a character says and what the reader knows to be true. * Symbolism - A literary symbol means something itself in the story but also suggests a wealth of meaning beyond what it actually is. An object, a situation, and actions can all be symbolic tools.
. Sensuous imagery - Images that appeal to the 5 senses: visual (sight); auditory (hearing); tactile (touch); gustatory (taste) and olfactory (smell). a. Figurative imagery - metaphor; simile; personification etc. b. Simile - a comparison of two unlike objects or persons that have point(s) in common - use of "like or as" Example - I wandered lonely as a cloud. c. Metaphor - a direct comparison between two unlike objects or persons without using "like or as" Example - She is a bear in the morning. e. Apostrophe - addressing or speaking to the dead as if living; to an object as if it is alive. The short stories and poems in Texual Tapestry utilise some of each of these styles and it is interesting to compare and contrast the application of them in each text. When the reader is actively conscious of the masterful techniques employed by writers in any type of narrative, the texts become all the more interesting to read. The writer has a Master's Degree in Hispanic and European Studies from Aberdeen University, Scotland. She also writes for The Guardian (UK).